"Care to share the specifics of your solar electric air conditioning system? There is no mention of the system on the website you linked." Talk about not seeing the forest for the trees! All of the writings about the Totally Solar Electric MOG boat and barely mentioned is the wonderful fact that the boat has real cooling air conditioning, yes A/C. Our fault. Notice the small window AC unit in the aft starboard window. It is easily moved to any of the over 12 window positions. Sometimes, things here at MOG are taken for granted, such as the creature comforts placed aboard the boat. People are simply aghast when they hear there is AC and moreover it works well. Also, no trawler type boat, that is low on fuel, is going to run the generator for air conditioning. That same idea applies to a MOG. If there is insufficient fuel (solar replenishment) to continue propulsion for a journey, the A/C is turned off. That said, when the breezes from traveling stop and the humidity is creeping up your back and coming down as sweat, the MOG can definitely turn on the cool. awaiting posting to their respective windows. In fact the brighter the sun, the more energy is developed for cooling the captain and crew. This is not magic but simply the solar electric array making copious sun driven energy into the battery bank, to the inverter, to the 5,000 Btu window AC unit ($99 at HH Gregg, Home Depot, Walmart or similar). What? You thought that it would be some super-sophisticated Lithium Bromide Absorption System or maybe even Kryptonite/Solar Electric? Nope. 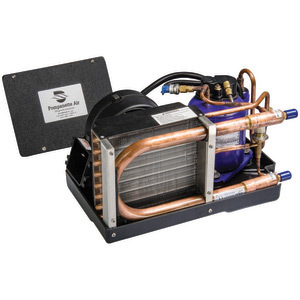 West Marine offers this raw water cooled AC, 115 volt unit for a bit over $1,100. 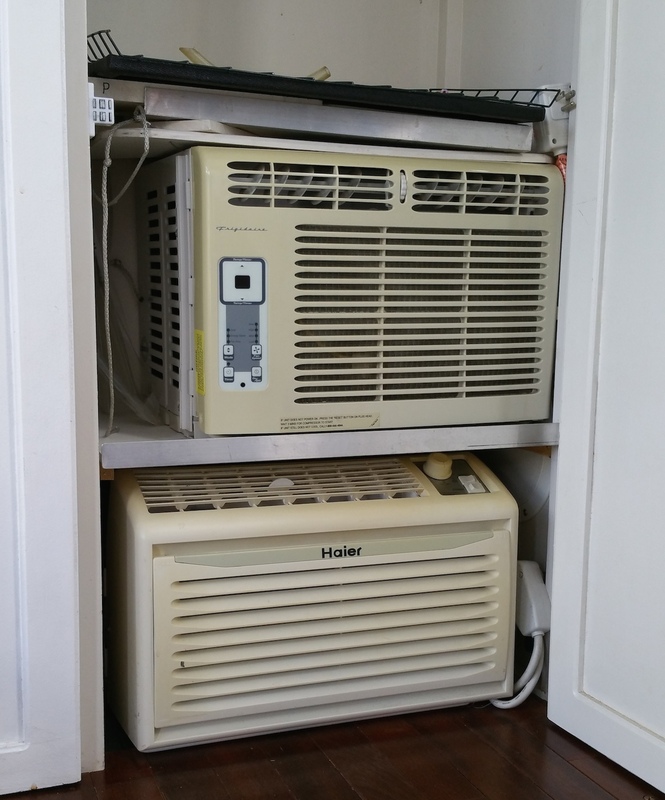 Why a plastic, common and inexpensive window air conditioner? First, the folks at CruiseAir make very good marine AC units. In fact I had one aboard the MOG when it was 30 feet (before the stretch to 40 feet). The compact under floor 5,000 btu unit worked just fine and had no problems. It was built very well and served until the day we put the boat aground for the night. After a few minutes the unit had no water running through the submerged water-cooling intake... the tide was out. Immediately the unit was shut off. Secondly, without the boat's hull immersed in water, there was no way to cool the refrigerant as it was being recirculated for the refrigerant's next cooling cycle. The AC unit was fine and sold to another boater. West Marine's new 12 volt DC, raw water cooled, 6,000 btu AC unit for about $2,200. Therefore, if one is to ground the boat, marine air conditioners using water that supports the hull cannot be used without even greater system complication. Several companies make very nice portable AC units for boats but they do not fit the physical envelope and shape of the MOG. The Haier and other small window types are all within an inch of fitment dimensions and use nearly the identical amounts of power. The small units are less expensive to replace than they are to have serviced. Take them back to the box store for disposal and buy a new one. 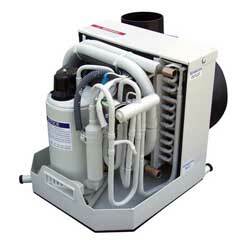 That was my idea when I got a quote for cleaning the raw water intake of the original marine AC unit. For the price of the cleaning procedure, I could buy a new window air conditioner. 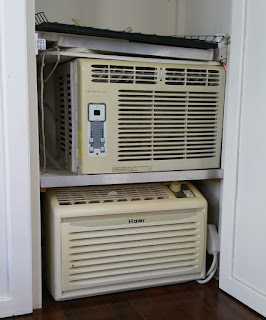 The window AC units are not called 'portable' but actually weigh less than some portable marine ACs and are very easy to install and remove from the MOG's custom window support. In fact, we take them out when making a journey and just pop it in, if used for the night or day once we are settled. The inexpensive window AC units are now nicely designed and have a very small window profile and do not overhang the side decks of the boat. The front unit sits in the center window of the bow window group and has often been left there throughout daytime travels. Barely visible is the center window mounted 5,000 btu AC unit. At night the aft side windows allow a 5,000 btu unit to be positioned so effectively around the bed that it is run on low/slow, remaining on all night and not draining the large battery banks. Proper window shades that have high rejection of solar heat gain are used in the windows to reduce the load on the AC unit. New types of shades are always being swapped and measured for increased insulation value. The quest for using less and less power never ends. Thanks for the question from 'Truth Is Not A Compromise' from a different forum to which MOG subscribes.